Slow and low heat. That's the way to cook all sausage on the BBQ. There’s two mysteries associated with the ubiquitous sausage we call hot dogs. The first is what actually goes into them. It’s a bit of an urban myth that all the “evil” bits of the butchered animal go into their making. Snouts, tails, ears, anuses – you name it – are cited as the grosser “meats” that are part of our weekend barbecue staple. It’s not far off the mark. There’s not a whole lot of redeeming virtue about what goes into a hot dog. 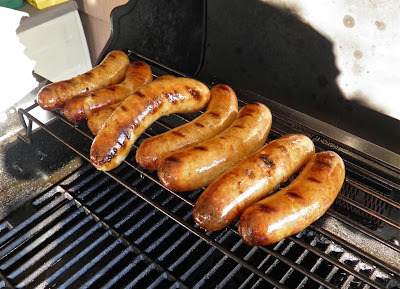 From varying sources, hot dogs are made from the trimmings left over from the butchering of a pig to make chops, bacon and ham. Depending on brand, they can also contain mechanically separated pork. That’s anything that can be recovered from a carcass through mechanical means like scraping or pressing – short of breaking the bone – or blasting with water. Most hot dogs also contain a large amount of turkey and/or chicken, obtained by an even more disgusting “mechanical recovery” method, grate pressing. The two meats are combined with water into a paste-like slurry, then flavoured, coloured and a whole host of preservatives added. Stuffed and ready for boiling. Starches such as potato or wheat flour are also added to bind the meat “slurry” together. 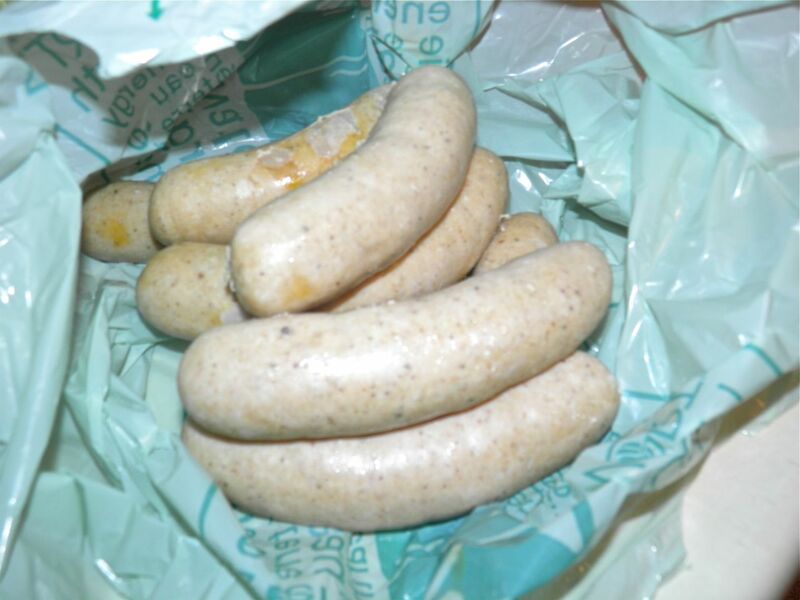 Some sausages are sold gluten-free. They don’t have wheat binders. Powdered milk, a non-nasty ingredient, is also commonly used as a binder. My recipe does, too. The binders are included to make the processed meats more consistent and palatable in the mouth. I have read some hot dogs are sold stating they’re not made from “real” meat. I'm assuming because no actual cuts of meat were ground to make them. The whole process seems to be a nasty business. It's been said that if you want to stop eating hot dogs, go see how they're made. In the darkness bind them... mmmmm, hot dogs. After boiling. Note the absence of "pink." Homemade hot dogs harken back to the time when food was actually food, with processing restricted to only what could be done at home. The second mystery (remember my two mysteries?) is where they originated. It is the subject of hot debate. 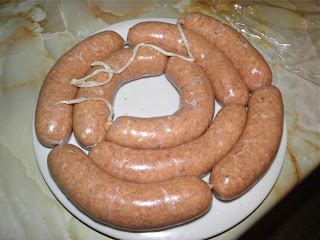 Sausage has been mentioned in literature (Homer’s Odyssey) as far back as 850 BC. One can only assume that they were common before that time. Hot dogs, or wieners or dachshund sausage, originate from somewhere in Germany appearing around the 15th to 17th century. Their history is rife with murder, sculduggery and mayhem. Not really. But their origins are certainly shrouded in conflicting information. In 1987 the city of Frankfurt celebrated the 500th anniversary of “frankfurters.” That would put the date there to the late 1400s. 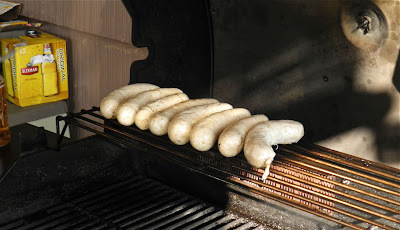 Another story has it that a butcher from Coburg, Germany made what he called dachshund (little dog) sausages in the 1690s and later travelled to Frankfurt to sell his products. On the barbie they went. Vienna, Austria also weighs in. The term wiener does seem to have a link to the real German name for Vienna, which is Wein. With this story a Viennese butcher received his training in Frankfurt and called his creation weiner-frankfurter or weinerwurst (Vienna and sausage). Regardless of where they originated, it is almost without doubt that they came with Eastern European immigrants to America in the 1800s. The frankfurter police get their knickers in a twist once agin when asked who actually sold the first “hot dog” on these shores, and when the name "hot dog" came into being. But does it really matter in the long run? What I really care about is still being able to eat my beloved hot dog-frankfurter-weiner without doing my body too much damage. A plate of homemade hot dogs and warm toasted buns. One of my ex co-workers joked that some day I would make my own hot dogs. Upon reading how they are made, and what goes in them, it’s no wonder I would want to. That’s where going back to the basics comes in to play. If you make your own you know exactly what goes into them. Since you’re not making meat slurry the consistency won’t be as fine as those highly processed packaged franks. If you do the optional food processor run (see recipe) you can get them closer in texture. I didn’t and they turned out wonderfully. They weren’t pink either due to the fact I didn’t use any curing salt (also known as pink salt, Prague powder or Insta Cure). I do like my hot dogs pink. I can use it in other homemade preserved meats I want to try as well. 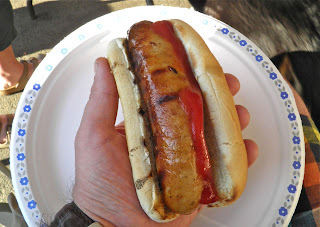 Besides that, these were as fine a hot dog as you could imagine, and even better because they were made at home. The spices were just about bang on. Not bad for cobbling together 4-5 recipes. We had a wonderful day here last Saturday and had a barbecue with friends at a house at the foot of the lake. Thank you for putting up with us. You know who you are. 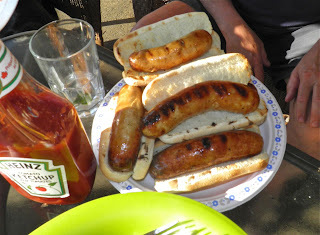 The frankfurters were stuffed into hog casing so were the size of “barbecue style” wieners. I do believe these will have to be put into rotation for summer soirées. They didn’t last long and were really, really good. Almost a revelation. just ketchup, to test drive the taste. Grin the pork loin and cap fat two or three times through a 1/4” plate on a meat grinder. Mix all the remaining ingredients with the meat and let sit overnight in the refrigerator. 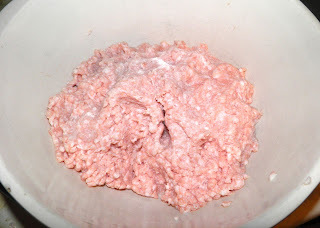 Optional step for a finer texture: Process the meat in small batches in a food processor until close to the consistency of pâté. Stuff into casings, either pork or sheep (smaller). I used pork casings for “ballpark” sized franks. Twist into desired length hot dogs. Boil the hot dogs in just enough water to cover them for 20 minutes for small casings, or 30 minutes for large. Once boiled they can be kept, tightly wrapped, in the refrigerator for up to 2 weeks, or frozen.